A very interesting field study was conducted in Finland when manual labour was compared with cleaning robotics. The conclusion was that, at least for now, robots are still too slow to replace the cleaner in work. Three public cleaning organizations in Finland conducted a common field study with cleaning robots. It was stated that a professional cleaner makes cleaning of floor 20 times faster than the cleaning robot. The test was made to find out if some of the manual labour operations could be replaced by machines. No reasonable reason was found for that. A robot cleaned a top of the shelf in 7 minutes when a cleaner took care of the same job in just 7 seconds. 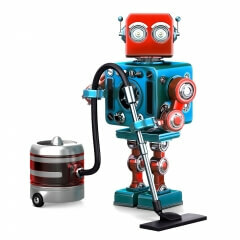 So far, 80% of the cleaning robots are still intended for household use. So far, only a few suitable cleaning robots has been launched to the Finnish cleaning market, even if the market size is estimated to be 1,6 billion euros. The cost of a Professional Hybrid robot is typically 10 000 € – 40 000 € per machine. The goal of the project was to study how to in the long term improve the productivity, develop work ergonomics, improve air quality inside at site and test new technology in the cleaning industry. Four different types of robots were tested during the project. The project team chose 4 test sites. Three of the sites were schools and one was a health care centre. The project team wanted to choose large sites for conducting the usability tests. It was also made sure that the cleaning staff had enough time to operate with the robots during the test period. The results were measured by measuring the cleanliness of the floor, amount of dirt in the machine dust container box and the dirtiness of the mop. Test project consultant stated that time is essential when operating with cleaning robot. Cleaning the space with a robot requires enough time to perform the operation. This is done easiest when the site is not populated e.g. during night time. Practically speaking a decision to be made is who operates the machine? Should a night guard be instructed for operating the machine or should a cleaner operate the machine while cleaning other spaces in the evening in the same building? The most effective scenario would be if the cleaner could supervise one big machine in operation or operate 10 small sized robots simultaneously. This vision still requires development of the sensor technology. The test project team stated that the travel logic of the machines would still need some improvements to work more securely. The space types inside the building defines whether it is wise to use a robot for cleaning in the building. For instance, a school floor surface area could consist of 10 000 square meters, but the space is divided into multiple rooms. It is not possible to access class rooms full of furniture with a big cleaning robot. The cleaning staff involved in the project started the testing phase with enthusiasm. However, that changed during the test while the cleaners found out that the machines did not meet the expectations. Out of the tested machines, one conclusion made was that especially the small sized hybrid robots are not useful for professional cleaning. They require further development before being suitable for professional use. It was also concluded that the use of robots requires new kind of thinking from the cleaning staff. No one should be afraid that the robots would replace a manual labour in cleaning. One surprising observation was made with the robot. The robot found quite an amount of dust in a recently cleaned space. In a standardized environment the cleaner and the best robots achieved equal results while wet mopping the surfaces. The best results with hybrid robots was achieved at spaces with easily removable dirt on the surfaces with 20-100 square meters. Vacuum robots seemed to work best in similar conditions for areas with 100-500 square meters. The article and the results are really interesting, since there has been a lot of discussion about the robotics coming into cleaning industry. Some fear that they might be losing their jobs due to the robots. Keep in mind, this article is only one test and tells one user experience. Robots could already be used in certain areas in cleaning work. However, there are many areas where robots are not suitable for doing the cleaning and manual labour will be needed to do the job. It seems that vendors still need to work on some features on the machines. It could easily be that the future cleaning company has loads of robots, but still a significant amount of manual labour taking care of certain parts of cleaning areas and operate the machines in standard spaces. The development and implementation of this technology remains to be seen.